NOTES: Converted from FBC-1 to production standards. This relatively large fighter bomber was designed around Rolls Royce Spey Mk.202 engines, which were at that time (early-mid eighties) still powering the British F-4 Phantoms. The first batches were b uilt around Rolls Royce built examples, but later Chinese license-built WS-9 turbines were installed. The first deliveries to the PLAAF were in the early 1990’s and were primarily test and evaluation pre-production types. The in-service designation JH-7 (JH stands for Jian-Hong, or fighter bomber) was assigned and production examples were being delivered in 2004 to the Chinese Air Force. The JH-7A is an improved model which is lighter and better equipped in terms of avionics. It is able to carry around 9000kg of ordinance and is equipped with a terrain following radar and data communications system. Even though the PLAAF now has much more capable aircraft, the JH-7A is still in service and there are rumours of a stealth version of it being developed, the JH-7B, but no hard evidence of it yet. The kit was issued around 2003, when the aircraft was still not finalized as the JH-7. It has many features that were present on the pre-production examples supplied to the PLAAF, like the single ventral fin, wing fences on the main wings and a framed windscreen. These can be corrected quite easily to represent a JH-7, but the real problem with this kit is the incorrect fuselage height, especially in the cockpit and intakes area. This has been known since the earliest issues of the kit as the mistake is not small. Some sources also say that it is too short in overall length, but dimensions vary from one source to another, so I decided to get the shape right as much as my skills permit, working with the kit parts as much as I could. The first thing I decided upon was not to rely on scale plans, as again these are very unreliable. Instead, I searched online for photos of actual aircraft taken with long telephoto lenses to eliminate perspective effects, and enlarged these on a photocopier to match the parts in the box. 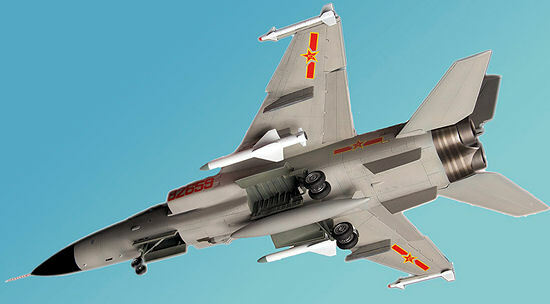 This assured that although it still might not be exactly 1/72nd scale, it would look like a JH-7 from any angle. Construction does not start at the cockpit here! First step was cutting off the fuselage halves to remove the excess plastic on the sides. I cut along the red line in the photo, and removed around 6mm (1/4”) from the area under the cockpit. I tried to remove along the centre of the cross section to enable the reattaching line to be sanded down easily without too much filler. I cut along the middle of the intake trunking and in between the auxiliary intakes. If you look at photos of a real JH-7, you can see that these are closer to each other than those of the kit, so this solves that problem as well. Another cut was made and some more plastic removed just before the main gear wells and along the lower line of the intakes. As stated before, I used the enlarged photo to match up the outline of the plastic parts with the real thing. After gluing it back again with some scrap plastic from behind to reinforce the join, I did the same on the other half, and kept them both pressed against a flat surface until both halves dried out with the mating surfaces as flat as possible. After a day I tried the fit of the two parts with each other, and surely although not perfect, they were closer to what I thought I would end up with. But before gluing the halves together, I had to fit the cockpit and front undercarriage bay. 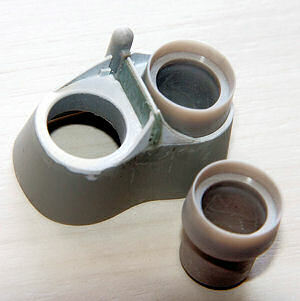 These are separate items and are glued individually to either half before closing the two halves together. Fortunately, both of them fit without any problem, and only slight sanding was required to place them on top of each other, with the top of the bay touching the cockpit floor. This was a bonus as it reinforced the whole front fuselage which had to be filled and smoothed many times. The rear part of the fuselage under the twin engines is a separate part, and it only needed some sanding on the edges to fit onto the assembled halves. The nose cone was completely different. It was now larger in diameter than the fuselage halves by around 3-4mm (1/8”). I split the cone into 4 petals but kept the point solid, and removed plastic from each cut until the diameter matched that on the fuselage. After getting the right diameter, I glued it back to an approximate cone, and once dry, I packed the inner with some pieces of lead and milliput, so that it would resist the sanding required on the outside. The afterburner cans in the kit are nowhere near those of the Spey engines. So I ordered a resin set from Aires intended for the Fujimi British Phantoms. When they arrived, I decided that I keep these for the Fujimi F-4K and use that kit’s plastic parts for this one. The area around the nozzles need a lot of correction, and was built up from plastic parts and milliput while maintaining the right mounting diameter for the Fujimi nozzles. After several sessions, the rear part was ready and it was off to another problematic part, the fin. The supplied part is too narrow in chord, and also has incorrect leading edge angles. I split the fin halves so that I could still use the leading and trailing edges, and enlarged the middle section with thick plastic, again using the enlarged photo as reference. Filler and sanding finished it off, and then some rescribing of panel lines was performed. The parachute housing was also lowered a little bit as it was too high. There are soom electronic sensors, probably RWR aerial on top of the fin and these were made from plastic rods. The single ventral fin in the kit was not used, instead the twin fins were made from plastic card. The main wings are not that bad and seem to be quite reasonable in their outline. As I mentioned earlier, they have the fences which were removed on production JH-7, so I removed them from the kit’s parts. I rescribed some detail and also added a few more on the top of the wings according to some photos. The scribing is not 100% correct, but I am more after the shape of the aircraft when I built my kits than the correct placement of panels. I fixed these to the main body and attached the flaps at deflected position but the ailerons in the neutral position. The tailplanes are also close to the real ones, but the attachment point is too high so I cut them with a new blade and after smoothing out their previous positions, fixed them at a lower level. I also sanded smooth the panel next to what seems an outlet from the engines which on the real aircraft seems to be a bare metal sheet riveted to the airframe. Trumpeter moulded it as a raised detail, but obviously it is overscale. I added some detail in the undercarriage bays from Evergreen sections to resemble the reinforcements in this area, as they are just plain boxes in the kit. I used the supplied undercarriage parts, but they look very weak (and they are as I broke one of them several times) and are nowhere near the robust real ones, but replacing them seemed too much hassle. The undercarriage layout in reminiscent of the Mirage F.1 and Jaguar, but obviously much larger, as this aircraft is huge when compared to the former two. The wheels in the kit are quite close, and both the main and front ones have a hole right trough to pass the “shafts” on the gear legs. After looking at photos of the real aircraft wheels, I decided to blank the outer side of the holes with white glue and left them to dry facing upwards to get a concave shape similar to the real ones. I cut off some of the lengths of the shafts so not to break off the blanked outer sides when gluing them in. The wheels were painted in aluminum and the undercarriage bays in RLM66 which seemed to match the photos available on the internet. Another modification was carried out on one of the fuel tanks. As supplied with the kit, the three tanks are incorrect in both shape and dimensions. I added plastic card and milliput again matching it up with the enlarged photos. I decide to modify just one and place it on the centre pylon, and use the larger missiles (which are the anti-shipping ones) on the inner wing pylons, and the AA missiles on the wingtip rails. I added a small strip of Evergreen on the rear side of the auxiliary intakes to make them square, and provide the intake with a step all round as the doors push inwards while deflecting for opening. The last modification was the windscreen. I made a former from plastic and more milliput and thermoformed the one piece windscreen on it. The rest of the clear parts were appropriate and I used these. However I think that the whole canopy is a little on the larger side in height, but I can live with it as it is. After fixing the canopy in place with white glue, I wasn’t convinced with the shape of the nose both the upper and lower contours, and I added more filler on top and sanded both sides to get a better looking front fuselage. There really is no choice for a colour scheme for this aircraft. All in service aircraft are all over grey finish with a black nose cone and anti-glare panel. There are some that had a green nose cone, but I think that these were all pre production examples and in fact they have a single ventral fin and fences on the wings, so it’s not an option for a JH-7. After a light coat of grey to check for imperfections in the filled up areas and several corrections afterwards, I pre-shaded the whole model and then applied AMC grey which I thought was a good match but once dry it turned out way too dark. I sanded it lightly, pre-shaded again, and then applied Humbrol 40, which is close to USN Gull Grey, in light coats and the final shade was close enough for me when compared with the photos I have downloaded. I do not know any source that state what the colours used on PLAAF aircraft are, so I had to rely on guesswork alone. I airbrushed the white panels on top, and a day later a coat of Klear was applied. Decals provided are useless, the insignia are of different sizes and the numbers are also too big. The only ones used from these were the ejector seat triangles below the canopy. The red star and bars came from an An-2 sheet that came with the Trumpeter An-2 and are all the same size, and the numbers came from a Fujimi Mig-21 sheet which had red digits from 0 to 9 in double on it. They are a little bit too large and too bold, but I could not find anything better. The other option was yellow numbers from the Trumpeter J-11 kit, but these were very small and I thought that the red ones are closer in font and size. The formation light came from an F/A-18 sheet, cut accordingly. Another coat of Klear followed, and I applied a light wash of a darker grey to the panel lines but kept the effect subdued. After another day or two, I applied the final coat of Humbrol satin varnish. Finally I added the numerous antennas on both the top and bottom of the fuselage, the undercarriage bay doors, afterburner cans, wheels and armament to finish it off. Being the furthest I have gone from a straight from the box build, it did not take that long to complete, and I was also making a couple of other kits with it. Finding information on these aircraft is not easy, and although there a quite a few photos online, there are still doubts to some details on the aircraft. While I am happy with the finished result, I am not claiming it to be perfect, in any way. Apart from the already mentioned canopy and undercarriage, there are other points, like the actual dimensions, and the shape of the main u/c bays and associated doors that are probably wrong. However the overall shape is way much better than if the kit is straight from the box. It is similar in dimension to an Su-27 Flanker in 1/72nd. I don’t think that we will ever see another kit of this aircraft in 1/72nd scale, so having this in my collection is surely a satisfaction to me.